Each petite cake is a combination of our melt in your mouth shortbread cookies and our fabulously moist and delicious layered cakes enrobed in chocolate and adorned with a hand cut flower fashioned from chocolate fondant. 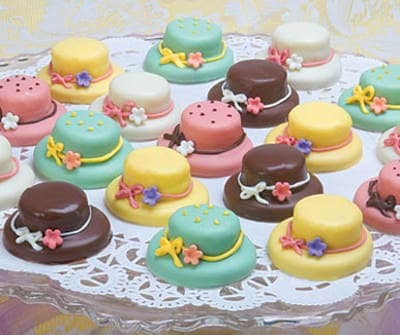 Dress up your table with our fun and festive petit four bonnets. Reminiscent of more gentle times when a charming hat or special dress was a must to celebrate the arrival of spring. These special confections are a combination of our melt in your mouth shortbread cookies and our fabulously moist and delicious layered cakes. Each petite cake is enrobed in luscious chocolate and adorned with a hand cut flower fashioned from chocolate fondant. Varieties include: Chocolate Mint, Banana Creme, Coconut Creme, Raspberry and Lime.